Kalkan., the rising star of Turkish Turquoise Coast where the renowned Greek poet Sappho had once lived, is 27 km from Kas and 215 km from Antalya. Popular mainly among tourists who enjoy a bohemian life, as well as British guests, Kalkan was formerly an old Greek village. Although it is sad to observe that the white washed houses decorated with Bougainvilles and spectacular gardens gradually become fewer and that the slopes are covered with newly built summer houses with every passing day, Kalkan still has the power to make you feel as if you have come across a good old friend. A much younger settlement area than Patara, Xanthos or Letoon, Kalkan used to be a secluded and calm fishermen’s village until 1960 and was quite dificult to reach by land due to the lack of roads. Villagers used to come to the port only on horses, donkeys or camels. Caravans loaded with charcoal, grains, silk, olive oil, cotton, wine, pine acorns, and cedar wood sold their goods to ships heading for Alexandria, Haifa, Rhodos, Smyrna. and Constantinople, and in return, received dry goods and notions, rice, sugar, and salt. In the l9th century, Kalkan was the most important port in the Teke Peninsula, and its people led a modern life in prosperity. However, when the time for the exchange of Turkish and Greek populations arrived, the Greek populace, who constituted 80 percent of the population. migrated to Greece. Most of these migrants established the city of Kalamaki near Athens, while some went to Australia, where they founded the Kalamaki Clup. 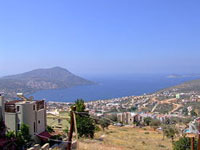 Kalkan is an urban protected area. The houses lining along the streets in the form of terraces that descend from above. The terraces from which one can view the sea, are arranged perfectly in accordance with the Mediterranean climate so that they can make the most of the breeze. Their small and narrow balconies, wide and spacious terraces, wooden doors, windows with shutters, and whide washed exteriors reflect the architectural traces of the Greek Island of Meis, but their most decorative elements are the handworked bearing bars between the floors and the grills above their windows. The false columns and column heads ornameting the corners of buildings, the handwork on the roof edges, and the wooden doors turn these houses into picture postcard settings. Some of the houses were restored by following the original plan, while others were built from scratch by taking the traditional stracture as a model. Traditional Turkish houses, though very few in number, can also be seen. These building are set along Greek houses. Eski Ev Boarding House and the adjacent wooden house with a brown balcony are the most remarkable examples of these Turkish houses. The old customs office buliding is the most pompous structure in Kalkan. It was built by a Greek notable in 1854, and at that time, the ground floor was used as a local pub, and the upper floor was a boarding house. For swimming, you can use the Kalkan shore only at designated spots because in addition to fisherman’s boats and motorboats, blue voyage schooners and yachts also anchor here. On the left end (when you arefacing the sea), you wiII see a public beach covered with pebblestones. The beach on a rock platform to the right of the port is managed by a few establishments, and can be used in return for a fee. Beaches on rock platforms are also present on the opposite cove in Kalkan, and you should definitely visit thern! The famous Club Patara Houses (timeshare villas and a hotel) ara the good places for staying in Kalkan. The adjacent hotel called MahaI de Kalkan hosts select guests. In Kalkan, the sea is always crystalline blue, but it does not get warm enaugh for swimming until the end of June. Especially in the uninhabited and calrn coves that are popular among people who go on daily boat cruises… Kalkan offers a wonderful alternative ta a sea-and–son holiday: plateau tourism. Situated at half an hour ta Kalkan, Bezirgan Plateau is a colorful village known for its salmon trout farms and horseback safari tours. A good way to spend the evening in Kalkan is going to a terrace restaurant. AlI restaurants have terraces that offer a fabulous view of the sea. Atter dinner, you can go to Yacht Point, where persons have a good time until the late hours of the night, visit Koko or go to the seaside ta watch the stars. As we have said before: Kalkan is a place where the stars ara closer… Herodotus, the “father of history” had this to say about Kalkan: “The Stars look the closest in Kalkan,” and this observation entered his ancient hook of history. Kalkan beach has blue flag.